On the same day it was announced that the LPGA told its foreign golfers on the tour to speak English or die and a nine year old kid was told he can’t play baseball because he is too good, Jason Kidd spurned Nike and signed with a Chinese company named Peak. Way to embrace communism Jason. Kidd isn’t the first American player to sign with Peak apparently Shane Battier has also turned commie red into American dollar green. If you notice the shoes look like knock offs of models that And1 and Adidas offer. For more on Kidd’s breakup with Nike, visit Kenlu.net (if you can read Chinese or just want to see pictures of the new shoes). 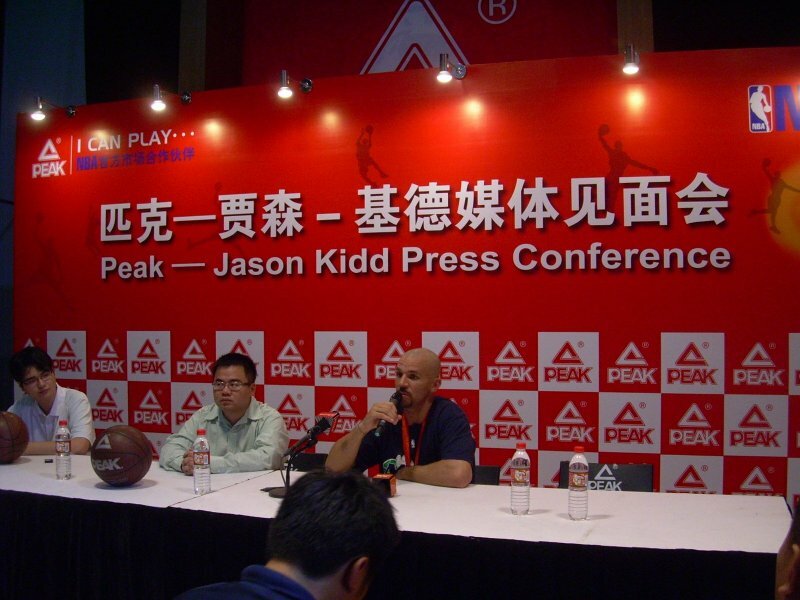 This entry was posted on August 27, 2008 at 6:20 am	and is filed under China, Jason Kidd, Nike, Peak. Tagged: China, Jason Kidd, Nike, Peak. You can follow any responses to this entry through the RSS 2.0 feed. You can leave a response, or trackback from your own site.